The Velusso Pyrénées Point-to-Point is a fully supported traverse of the Pyrénées, from the Atlantic Ocean to the Mediterranean Sea, over several mountain passes. A ride for the adventurous, for experiences that will live long in the memory. There’s only one thing better than riding in the Pyrénées, and that’s riding across them. 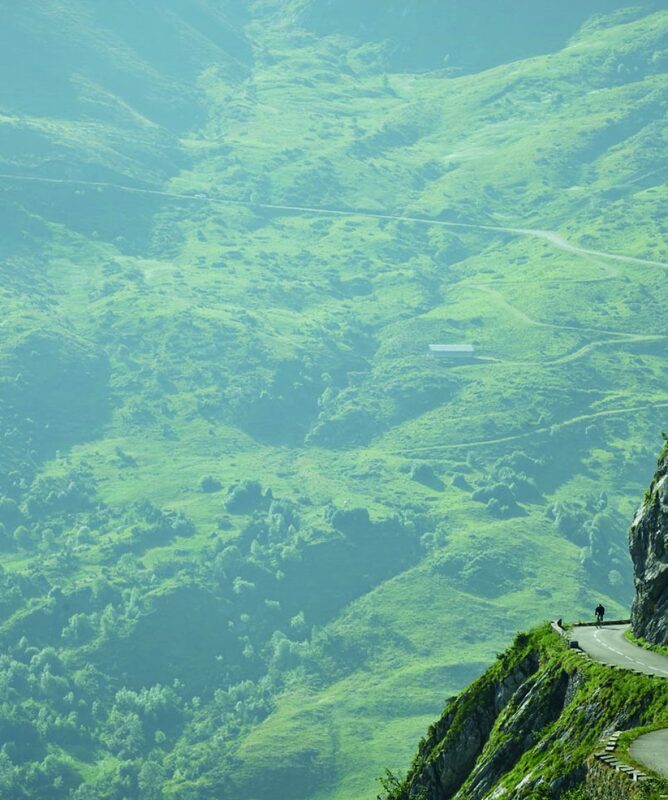 The Pyrénées Point-to-Point harnesses everything we love about road cycling, and matches it with the sense of adventure that comes with riding point-to-point. The result is a truly epic week on the bike, dipping between France and Spain, over high mountain passes immortalised by both the Tour de France and Vuelta a España. A journey through culture, climate, language, and geography, the Pyrénées Point-to-Point is a road cycling adventure to remember. Average of 140km / 2,625m ascent per day. Recovery massage and hand-picked hotels at the end of each day. Fly or take a train to Biarritz where a team member welcomes you. Bike set-up and an afternoon spin. Accommodation: La Maison du Lierre ***. Biarritz – Oloron-Ste-Marie. 130 km / 3100 m.
Saint-Savin – Bagnères-De-Luchon. 110 km / 3350 m.
Accommodation: Hotel Alti Luchon ****. Luchon – St-Girons. 130 km / 3100 m.
St-Girons – Gincla. 170 km / 3300 m.
Accommodation: Hostellerie du Grand Duc ***. Gincla – Collioure. 140 km / 2050 m.
Accommodation: Collioure le Mas des Citronniers **. Transfer from the hotel to Perpignan airport or train station. trip, and they vary between ** to ****. you would prefer to share a room, please get in touch.